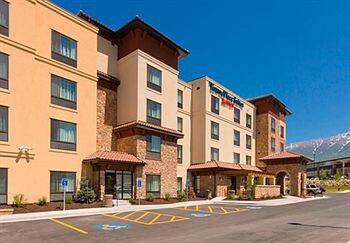 Property Location Located in Orem, TownePlace Suites by Marriott Orem is in the business district and close to McKay Events Center and Utah Valley University. This hotel is within the vicinity of Utah Lake State Park and Provo Utah Temple.Rooms Make yourself at home in one of the 100 air-conditioned rooms featuring kitchens with full-sized refrigerators/freezers and stovetops. Your pillowtop bed comes with down comforters. Wired and wireless Internet access is complimentary, while 42-inch LCD televisions with satellite programming provide entertainment. Conveniences include desks and complimentary newspapers, as well as phones with free local calls.Rec, Spa, Premium Amenities Be sure to enjoy recreational amenities, including an indoor pool, a spa tub, and a fitness center. Additional features include complimentary wireless Internet access, gift shops/newsstands, and a television in the lobby.Dining A complimentary continental breakfast is included.Business, Other Amenities Featured amenities include complimentary high-speed (wired) Internet access, a 24-hour business center, and express check-in. Planning an event in Orem? This hotel has facilities measuring 900 square feet (84 square meters), including conference space. Free self parking is available onsite.